I recently spoke with my uncle, Ronald D. Waugh Jr., who served as Vice President of Business Development for W.R. Grace Cocoa and later Archer Daniels Midland from the years 1993 to 1999. W.R. Grace Cocoa had factories in Amsterdam and Wisconsin, and he worked in both locations over the course of his career. In our conversation, he spoke about the intricacies of supplying cocoa products to large clients like Nabisco and Unilever, as well as his experience visiting their business partners in the Côte d’Ivoire (pictured below). When he left in 1999, he estimates that the company was processing roughly twenty-five percent of the world’s cacao. Although his company took corporate social responsibility seriously and was regarded as a progressive employer by many of its workers at the time, he acknowledges that these terms have taken new meaning in modern times. This new level of social awareness is especially evident in Portland, Oregon, the city he now calls home. W.R. Grace Cocoa’s European headquarters in Amsterdam specialized in the processing of cacao beans and chocolate products including liqueur, cocoa butter, cocoa cakes, and cocoa powder. For sourcing, Grace turned towards cacao growing regions in countries throughout West Africa such as Ghana, Cameroon, and Côte d’Ivoire, as well as East Asian countries like Indonesia. At its height, Grace Cocoa sold more than $700 million in industrial cocoa and chocolate products around the world annually (New York Times 1996). Grace was able to do so because of the diversity of their clients’ products. Their needs differed based on the intended use of the cocoa, and my uncle facilitated many of these corporate relationships. One of the first distinctions he made in our conversation was that between actual chocolate, and what is considered “chocolate flavor.” Chocolate liqueur, which is made from the pressing and grinding of cacao beans, is divided into two main substances: cocoa and cocoa butter. In order for a product to legally labeled as containing chocolate in the United States, cocoa butter must still be present. Otherwise, the product must be denoted as “chocolate flavored.” Fat-content impacts the flavor of the products, and more legal standards of identity determine these ratios. Low-fat content chocolate must contain between ten and twelve percent cocoa butter, while high-fat content chocolate must contain between sixteen and eighteen percent cocoa butter (Waugh 2017). Because cocoa butter is the more expensive ingredient of chocolate, Grace Cocoa was able to generate savings for their clients when they could optimize the fat content. Sometimes, this also required the blending of cocoa from different batches, the processes of which also had to be developed in their labs. According to Waugh, they would aim for 10 percent fat-content in their low-fat chocolate products, and sixteen percent in the high-fat chocolate products, as to fulfill fat-content standards, and minimize input costs for their clients (2017). Common substitutes for cocoa butter are forms of vegetable fats and oils. These substitutes can be made for reasons of cost, as cited above, but also desired physical properties of the final product, such as melting point or mouthfeel. True cocoa butter melts at the temperature of the human body, eighty-six degrees fahrenheit, while compound chocolate has a higher melting point (Muir 2015). The higher melting point of these coatings make them ideal for use on ice cream products, compared to a candy which the consumer will eat right away. Appropriately, Grace Cocoa was contracted to supply the chocolate coatings for Unilever’s Magnum ice cream bars, which were made from Grace’s variety of chocolate flavorings. Other attributes of cocoa also came to be important to Grace Cocoa’s clients. Other factors clients cared about included grittiness, viscosity, and color. Adjustments in these could save or cost their customers money over time. One example he cited, was if the chocolate was intended to go on top of oatmeal cookies, the smoothness of their chocolate did not matter as much. The oatmeal would mask any grittiness in the chocolate, and they could save money in the production process, which Grace Cocoa would pass onto their customers. Viscosity of the chocolate Grace sold was also important, as it would come into direct contact with the customer’s machinery. A chocolate liqueur that had too much viscosity could potentially clog up a client’s machines, leaving them unable to produce their final products. Finally, the color consistency of the cocoa powder was of utmost importance. Grace Cocoa was one of the only companies that had the resources to consistently produce black cocoa powder — as result, they developed an exclusive relationship with Nabisco to provide the cocoa for their iconic Oreo cookies. The popularity of these international brands puts pressure on companies like Grace Cocoa in order to satisfy the world’s demand. Demand for chocolate is relatively inelastic. In my uncle’s experience at Grace, their predictions for the growth of demand in a particular country would roughly mirror population growth (Waugh 2017). If the population was expected to grow by one percent, they could also expect a one percent growth in the demand for chocolate products. The only exception to this rule being Asian countries, where chocolate only caught on through the cultural practices of gift-giving. As result, marketing strategies are different in Asia. Authors of the book, The Economics of Chocolate explain, “foreign chocolate makers devote much in advertising and packaging efforts to promote chocolate as a gift that symbolizes love and friendship” (Squicciarini and Swinnen 2016). Waugh says that he and his colleagues used to joke, that if they could get every person in China to eat one chocolate bar per year, they would all be able to retire. With demand being predictable and constant, any challenges that those in the cocoa industry would face almost always came on the supply side. “The quality of beans, the capricious rains, the unpredictable harvests, the cost of pesticides, the threat of witch’s broom (a disease of the Theobroma tree), the see-saw prices and the exorbitant government taxes. These farmers know everything about the difficulties of growing cocoa in this region” (Off 2008). Cacao rose to prominence as a cash crop in West and Central Africa due to the regions’ favorable growing climates. In these areas, politics have become greatly intertwined with the cultivation of cacao, and consequently many hurdles and question marks exist for the villages who make their livelihood farming cacao. Companies that must meet the world’s demand for cacao, like Grace Cocoa, are forced to mitigate the risk of fluctuations in supply by sourcing their beans from African business groups with ties across their countries, instead of the farmers themselves. My uncle worked directly with these people, and even visited Côte d’Ivoire periodically throughout his time working in the industry. In his visits to the Côte d’Ivoire, Waugh and his colleagues frequently interacted with figures like Pierre Billon, father of the current Ivorian Minister of Commerce, Jean-Louis Billon. Pierre Billon, who has since passed away, is described as, “a tycoon and close confidant of Côte d’Ivoire’s founding father, Félix Houphouët-Boigny” (Abidjan 2013). Navigating these relationships was challenging, because unlike in Western countries, these were the types of men which influenced everything within the country, even on a governmental level. On one of his trips, my uncle was awarded an officer medal from Côte d’Ivoire’s Ordre de Mérite Agricole, or the Order of Agricultural Merit. Admittedly, he said this was fun to receive, but he also acknowledges this gesture may have been an attempt to warm up to him. He was able to visit several farms and see the harshness of the wilderness, but he never expected the modern revelations that more sinister practices were taking place. Waugh describes the cacao production he saw within the Côte d’Ivoire as much more “artisan” than plantations he’d seen in other parts of the world like Indonesia (2017). Plantations didn’t exist in Côte d’Ivoire, or at least he wasn’t shown them. It was explained to Waugh that primarily Lebanese men called pisteurs, would travel the treacherous terrain to the farms around the country in order to collect the cacao beans. Carol Off explains her experience navigating Côte d’Ivoire’s bush country, “Tangled vines and shrubbery encroach on both sides of our vehicle while we push through what resembles a dark, leafy tunnel. Constant precipitation — a perpetual cycle from warm mist to torrential thundershowers to steam — seems to stimulate the new jungle growth before my eyes” (Off 2001). The density of the unforgiving wilderness seemed to distract from the idea that forced labor could exist in the area. Another circumstance which may have covered up the forced labor practices to visitors like my uncle, was the small size of the cacao farms within the country. Duguma, Gockowski and Bakala explain, “In the humid west and central Africa, cacao (Theobroma cacao Linn.) is one of the most important cash crops and it is grown largely (> 80%) by the small-scale farmers” (2001). The average farm size is only 2.5 hectares, or just over 6 acres (see table below). Waugh explained that the farms he saw were also home to animals like pigs and chickens. Although it never crossed his mind that inhumane conditions could’ve existed, he does admit that he feels somewhat complicit in the things that were happening (2017). Looking at the larger picture of the cocoa processing operations, both Grace Cocoa and Archer tried to spread out production means, in turn helping several regions throughout the world. Waugh says that production operations were based out of Amsterdam, because the Netherlands had readily available means of processing the cacao beans. The technology that they relied to do so was ancient, and it was the windmill. Grace Cocoa used the means of production that was convenient, and because much of the world’s cacao was entering Europe through Amsterdam, it simply made sense to station their operations here. Waugh says he was often asked why Grace or Archer Daniels did not build processing plants in Africa — and his response? They did. In 1997, following the acquisition of Grace Cocoa, ADM became a shareholder and later the outright owner of Union Ivoirienne de Traitement de Cacao (Unicao). Unicao, a local cocoa trader and processor owned a plant in the city of Abidjan (Squicciarini and Swinnen 2016). Photos of the factory can be seen below. Having these operations within the country certainly cut some of their overhead costs of shipping unprocessed beans, but it also limited their supply to Ivorian cacao. The company was forced to blend their cocoa cakes in this factory, and Waugh says this worked for some applications, but not all. Conditions in communities throughout Côte d’Ivoire are still rough today, but Grace and later Archer, did what they could to help out at the time. Carol Off writes, “The community’s livelihood comes from growing “the food of the gods,” but this is a long way from paradise. None of the children here go to school, and there are no services — no electricity, no phones, no clinics or hospitals” (2008). Waugh explained that both Grace and Archer were regarded as progressive employers in the Côte d’Ivoire. In the city where their processing plant was located, they built several schools and a medical clinic. They also provided housing for the African managers of their factory. Community members believed that they were a fair employer and as result, both parties felt better off because of the balance of loyalty. In the era of the internet, corporate responsibility has gained a lot of prominence. Perhaps, it is because heightened transparency has increased the accountability of corporations. One brand that brings that close to home (literally and figuratively) for my uncle is called Tony’s Chocolonely. With locations in Portland, Oregon, and Amsterdam, the brand directly sources their cocoa from farmers in Ghana and Côte d’Ivoire. The reason? They want to ensure that the cacao is not grown, harvested, or processed by slave labor in any way, shape, or form (see link below). At one point not too long ago in history, corporate responsibility simply entailed treating employees, communities, consumers and the environment with respect. Building housing, schools and clinics would’ve been considered going above and beyond one’s obligations. In today’s globalized world, that may not be enough. I don’t think that means any firm in particular was in the right or in the wrong, but future generations have a responsibility to learn and grow from history. I’m grateful that through this project, I was able to learn more about the complexities chocolate production through my uncle’s expertise and experiences. Abidjan, A. R. “A Rising Star.” Blog Post. The Economist. The Economist, 3 May 2013. Web. 5 May 2017. “Archer in $430 Million Deal to Buy W.R. Grace Cocoa Unit.” New York Times, Dec. 24, 1996. pp. 1, ProQuest Historical Newspapers: The New York Times. Duguma, B. Gockowski, J. & Bakala, J. “Smallholder Cacao (Theobroma Cacao Linn.) Cultivation in Agroforestry Systems of West and Central Africa: Challenges and Opportunities.” Agroforestry Systems 51 (2001): 177-88. Springer Link. Web. 5 May 2017. Muir, April. “Candy Making: Facts about Chocolate Compound Coating.” Sephra. Sephra, 03 Oct. 2015. Web. 05 May 2017. Squicciarini, Mara P., and Swinnen, Johan. “Chocolate Brands and Preferences of Chinese Consumers.” The Economics of Chocolate. Oxford: Oxford Univ, 2016. N. pag. Oxford Scholarship [Oxford UP]. Web. 5 May 2017. Waugh, Ronald D., Jr. Telephone interview. 3 May 2017. Chocolate has been a staple of Western culture since the time that it was brought over from Mesoamerica by the Europeans. Big Chocolate companies like Cadbury, Hershey, Mars, Nestle, and Ferrero Rocher now control over 99% of this market (Martin, “The Rise of Big Chocolate and Race for the Global Market”). On the other hand, single origin chocolate companies make up a much smaller margin of this market. Now that there are so many options – including brand, flavor, and texture to choose from – how does one make their ultimate decision? Factors like consumer awareness of production methods, the way that it is marketed, and convenience play crucial roles in the kind of chocolate people choose to consume. To begin, it’s important to illustrate what Fair Trade is and who exactly it affects. Making chocolate is a ten-step process, and most of those steps are conducted by people in places like West Africa, specifically in Cote de’Ivoire and Ghana (Martin, “Modern Day Slavery”). In addition to the big companies controlling the vast majority of the market, Big Chocolate also retains over 90% of the money from the sale of the chocolate, while the actual producers are left with what little remains (Martin, “The Rise of Big Chocolate and Race for the Global Market”). This is one of the many problems in the relationships between Big Chocolate and their African farmers, as will soon be further illustrated. Fair Trade Certifications and other labels indicating positive labor treatment are becoming more sought-after by consumers to the point where companies are creating labels of their own (cite – lecture). The goal of Fair Trade is to help farmers build sustainable businesses that can continue to prosper and be beneficial benefit all parties involved (Martin, “Alternative Trade and Virtuous Localization/Globalization”). Since the conditions in other countries aren’t being monitored by their government, it is important for them to be monitored by some sort of organization to ensure ethical treatment. However, the goals of Fair Trade are often far from what is actually achieved. While they’re trying to invest in the local communities, Fair Trade can lead to an inefficient marketing system where corruption flourishes (Martin, “Alternative Trade and Virtuous Localization/Globalization”). It’s also been known to hurt the non-certified farmer (Martin, “Alternative Trade and Virtuous Localization/Globalization”) because a positive addition to the circumstances in Africa shouldn’t be a negative one for those that aren’t able to be a part of it. In order to have a Fair Trade Certification label on a product, only 20% of the ingredients have to be produced under the specified conditions (Fair Trade USA), which can be incredibly misleading for the people who aren’t aware of this. The Fair Trade system, while it does have positive goals and some positive outcomes, can’t necessarily be relied on for regulating the labor conditions under which chocolate is produced. Consumers today are becoming more aware of ethically sourced chocolate, which Maricel Presilla talks about in New Taste of Chocolate: “Many consumers today share such concerns about cacao farming. They are starting to ask questions about farming methods and the well-being of farmers. There are people who as a matter of principle won’t buy anything produced without Fair Trade or organic certification” (133). This definitely doesn’t represent all consumers, however, a trend has begun in this direction as it hasn’t before – the consumer is being made aware of the conditions of the producer. Although these certifications are marked on many items and are advertised for their positive regulation of conditions, disregarding the efficacy of the certification, the fact that not all ingredients have to be ethically sourced goes entirely unpublished to the general consumer. If searched for, the companies’ websites will generally provide all information, but that isn’t accomplished without significant individual time and effort. “In its press release announcing the launch, the Co-op indicated that it wished to ‘start a race amongst major UK supermarket groups anxious to demonstrate that they care and are eager to establish their ethical credentials’” (Nicholls & Opal, 101). This trend was also seen across the world as Starbucks changed all of its own-brand chocolate to Fair Trade Certified in 2002 (Nicholls & Opal, 101). While Starbucks is generally known to be a socially conscious brand in America and its consumers are a wide range, they still reach a huge number of people with their positive message of certification. When people are aware of why certain products are Free Trade certified, it is generally assumed that some of them would take that into account when making a purchase. However, it can be difficult to rely on consumers for such a task since Big Chocolate companies, which often aren’t certified, produce such large quantities for such an inexpensive price. Mass production of any goods tends to lower the quality, whether in regard to cars, clothing, or chocolate. Yet affordability is such an important aspect when buying a treat on the way out of the store – a tendency that is specific to Americans (Martin, ““The Rise of Big Chocolate and Race for the Global Market”). Rosie Wigglesworth, a sophomore at Harvard University, said that she never spends the money required to purchase a single origin chocolate bar from a specialty shop when she can spend a fraction of that money to buy the same amount or more chocolate from CVS. In addition to being less expensive, Big Chocolate companies get their customers to keep coming back by marketing to what we celebrate most – holidays. So often, the marketing insinuates all that will come out of giving chocolate as a gift, like falling in love on Valentine’s Day. Consumers have been conditioned to accept chocolate as such an important aspect of many holidays that intrinsically have nothing to do with it. As soon as Valentine’s Day is over, being inside a CVS can be both a sad and exciting thing. For chocolate lovers, it is a great day since all of the themed candy is now 50% off, but it is generally a mess and broken. Next to the Valentine’s Day themed candy shoved in the corner is all of the fresh Easter candy that has just been shelved and waiting for Easter to come in order for it to reach its many consumers. Since much of the candy that is bought is done so for the sake of festiveness and quantity, the general consumer wouldn’t even consider buying it at a specialty shop that likely wouldn’t attend to the holiday in such a dedicated way. This form of specialized advertising can be seen multiple times throughout the year, and is one of the ways that Big Chocolate companies retain its customers. This Cadbury product represents how the Big Chocolate companies advertise and market their chocolate specifically for holidays. Another strong reason for so much popularity of the cheap chocolate is its convenience. Located next to every CVS register, it is incredibly easy for a consumer to just grab it on his way out, even if he wasn’t originally planning on getting any. In The Economics of Chocolate, Squicciarini and Swinnen talk about nudging, which can get someone to make one decision over another due to convenience (161). Given the observation that food decisions are often made relatively mindlessly and the environmental cues can therefore play a large part in steering these decisions, we explore the possibility that nudging is a potentially powerful technique to trigger behavioral change” (Squicciarini & Swinnen, 161). People go to CVS every day for things that meet their needs for medicine, beauty, and school. Sometimes they probably have chocolate in mind when they come in, but regardless, it definitely is when they are heading out. This kind of store, where almost all shopping needs can be met, is an excellent place for such an easy temptation to be stored. Big Chocolate knows this, and they can afford to acquire the shelf space and deliver the profit margins to stores like CVS that keep this cycle going. Unlike Big Chocolate, single origin brands pride themselves on the way that their chocolate is produced. While companies like Cadbury are incredibly secretive and have very rarely given the world insight on their chocolate-making process, these single origin businesses tend to be incredibly upfront about their production methods and values. They use this fact as a marketing alternative to that of Big Chocolate. These can easily be found on their websites, which is not what one would find on Hershey’s. This chocolate is made in small batches, so the quality is significantly higher. These companies are known for outsourcing in ways that allow for ethical treatment in the production process, and therefore, many of them are Fair Trade Certified. Small chocolate companies tend to be founded for reasons other than mass expansion and market takeover in the way that the Big Chocolate companies currently dominate, such as passion or happening to be in the right situation. Single origin companies advertise, but in a way much different than Big Chocolate does. Of course there is the difference of scale to which they are able to market but also the chocolate they choose to display. Instead of it being about what chocolate can do for you, as is the case for some Big Chocolate marketing, they focus more on its origin and quality. It’s not about the big events going on that it is a gift for, but rather appeal to consumers to make the ethical and environmentally sound choice when choosing to buy chocolate. Green & Black’s Fair Trade Certified company focuses on the natural elements of the chocolate in their marketing. A major difference in terms of convenience of the products, is that these are much more difficult to find in a price-conscious store like CVS. The small batches with attention to detail plus the Fair Trade prices result in a single specialty bar commonly reaching about $9. This is not the kind of thoughtless purchase one generally makes at the register. Most people have a general knowledge of Fair Trade Certification’s existence and the fact that it benefits people at the bottom of the production ladder. Many people don’t know the details, especially the negative aspects that can be so severe that struggling groups of farmers in other countries make the choice to not be a part of it. The general public consensus right now, from the people I spoke to about it, is that Fair Trade is an overall positive certification and group to be a part of. I decided to test how much of an effect on taste preference this knowledge of Fair Trade had on consumers. I did this by recruiting people I know and asking how much they knew about Fair Trade. I then divided them into three groups – one that knew almost nothing but assumed that it was good; one that knew some details about the way that it operated; and one that was fully aware of both the goals and consequences since two of them are also in the class. All three groups were part of trials conducted separately, but they all received the same chocolate in the same order. The only difference is what I said about each piece they were about to eat. All four pieces were from Potomac’s 70% dark chocolate, including bars with cacao beans from Costa Rica, Peru, Venezuela, and the Dominican Republic. Each trial I changed which ones I said were from Fair Trade Certified companies, always changing the two I said that were and the two I said that weren’t. I then asked everybody to rank the four chocolates in order of the favorite. Kristen and Christina tasting the different kinds of chocolate during our taste test. The results showed that everyone always had at least one of the “Fair Trade Certified” bars in their top two preferences. While these four bars did vary slightly in flavor, I still conclude that people were affected by the knowledge of where the chocolate came from and how it was made. These 70% dark Potomac chocolates were being tasted in order to determine preference in relation to Fair Trade Certification. A lack of awareness can play a huge role in the conditions that still exist for chocolate producers today. Millions of children are involved in child labor today, specifically to produce chocolate, by being trafficked mostly from Mali to Cote de’Ivoire and Ghana (Coe & Coe, 263-264). Blatant racism is also unrecognized because people miss the subtly that exists now as a byproduct of the extremely long history connecting chocolate and slavery. Charlie and the Chocolate Factory’s Oompa Loompas, Spanish Conguitos, and Belgian chocolate hands have all been discreetly displaying racism in a way that few perceive. These “cultural blindspots” show the gaps that exist in knowledge about where such images and concepts came from (Martin, “Race, Ethnicity, Gender, and Class in Chocolate Advertisements”), which holds us back as a whole. While not everybody can be convinced to spend more money to buy Fair Trade Certified chocolate bars, many more people could be swayed against buying chocolate that depicts slavery in such a way. Not everyone knows about the way that chocolate is made, and that along with how it’s marketed and convenience of consumption is how people make the decision of what chocolate to buy. Coe, Sophie D., and Michael D. Coe. The True History of Chocolate. 3rd ed. London: Thames & Hudson, 2013. Print. 2Collier, Dan. “Green & Black’s.” Dan Collier. Green & Black’s, n.d. Web. 01 May 2017. 1“EXCLUSIVE: Cadbury’s Tapping the Specific Occasional Gifting Opportunity: Anil Viswanathan.” Pitchonet. Pitch Magazine India, n.d. Web. 02 May 2017. 3Friends trying different types of chocolate, Cambridge. Personal photograph by author. 2017. Martin, Carla. “Alternative Trade and Virtuous Localization/Globalization.” Chocolate, Culture, and the Politics of Food. Harvard University, Cambridge. 5 Apr. 2017. Lecture. Martin, Carla. “Modern Day Slavery.” Chocolate, Culture, and the Politics of Food. Harvard University, Cambridge. 22 Mar. 2017. Lecture. Martin, Carla. “Race, Ethnicity, Gender, and Class in Chocolate Advertisements.” Chocolate, Culture, and the Politics of Food. Harvard University, Cambridge. 29 Mar. 2017. Lecture. Martin, Carla. “The Rise of Big Chocolate and Race for the Global Market.” Chocolate, Culture, and the Politics of Food. Harvard University, Cambridge. 15 Mar. 2017. Lecture. “Multiple Ingredients Product Policy.” Fair Trade USA. Fair Trade USA, 2017. Web. 03 May 2017. Nichollis, Alex, and Charlotte Opal. Fair Trade: Market Driven Ethical Consumption. London: Sage, 2011. Google Books. Google. Web. 1 May 2017. Presilla, Maricel E. The New Taste of Chocolate, Revised: A Cultural & Natural History of Cacao with Recipes. Berkeley: Ten Speed Press, 2009. Print. 4“Shop.” Potomac Chocolate. Potomac Chocolate, 2017. Web. 03 May 2017. Squicciarini, Mara P. and Johan Swinnen. The Economics of Chocolate. Oxford: Oxford University Press, 2016. Google Books. Google. Web. 1 May 2017. Chocolate is sinful and mature; it has the power to make people happy, especially women. That exact set of information could come from any chocolate commercial like the “Dove Senses” one linked above, but also came from three people interviewed on their relationship with chocolate both in their childhood. All three subjects came from different regions of the United States, were born in different generations, and were of different ethnicity and genders. Throughout the interviews conducted, chocolate was described as a happy food, lightening people’s moods and comforting them after long days of work. When remembering their childhood experiences with chocolate and their feelings about eating it as adults, they all thought it to be indulgent and somewhat sinful, two of the three linking chocolate with weight gain. Two of the three interviewees were born before 1985 and mentioned how chocolate commercials have markedly transitioned from focusing on children to more adult and mature marketing tropes. Lastly, in each interview, women were thought to enjoy and like chocolate more than men regardless of the gender of the interviewee. “Big chocolate” has taken these commonly held beliefs about chocolate and based their marketing off of it, and, in turn, has convinced an even larger audience that chocolate will make them happier, curb their desire, and is not just for children, but also adults. The Butler’s Chocolates ad above assumes that giving a gift of chocolate is gifting happiness; all three interviewees would agree. One interviewer, Andrew*, would go so far as call it a “natural craving”; he believed that if you’ve eaten chocolate once, you want to eat it again, comparing it to a drug. Chocolate has been described as a drug, a craving, and an addiction, but the actual attraction that chocolate has to human taste buds is theorized to come from the high fat and sugar contents or its palatability (Benton 215). Because the body wants as much fat and sugar as possible for survival, it releases endorphins inside the brain making consumers happier and more energized. Endorphins allow the brain to understand and calculate faster and with ease which naturally makes people happier; chocolate being seen as a gift of happiness is not far off from the physiological and psychological truth (Wenk, 17). Humans naturally crave food, but crave chocolate more commonly than other foods because of its palatable contents like junk foods (Benton 206). Chocolate could not be considered as addictive though. Drugs of abuse release endorphins and dopamine into the brain similarly to chocolate, but the craving for these drugs after first-time usage comes from a place of loss rather than a physiological craving (Benton 215). When the brain recognizes that a food is high in fat and sugar content, it craves the food, sometimes without the subject ever tasting it; chocolate consumption has a physiological purpose to the human brain whereas drugs of abuse do not until used for a first time. Although positive reactions were the first reactions to questions about chocolate, interviewees listed negative emotions and feelings as well. An interviewee, Matt, said that it sometimes made him feel fat, uncomfortable, and overwhelmed if he ate too much. The two others, Andrew and Jessica, linked chocolate to unhealthy weight gain and obesity, Jessica claiming it as a possible gateway food to an unhealthy lifestyle. Unprompted, negative reactions were listed after positive reactions felt about chocolate and its consumption. On the surface and in television commercials and ads, chocolate brings joy, happiness, and celebration, but consumers recognize the dark consequences of eating too much chocolate or becoming too reliant on it as a mood booster. Chocolate physiologically and psychologically makes people happy so marketers play off of it as a cure-all for a hard day or stressful week. In every interview, Willy Wonka & the Chocolate Factory was described as an important childhood memory of chocolate; the famous chocolate river surrounded by a confectionery forest is delightful to the eye and the stomach, leaving a lasting impression into adulthood. The film may have a sweet candy coating, but the theme itself is all sin. Throughout the film, spoiled kids get whisked away because of disrespect, gluttony, greed, pride, etc. The first of these exits by the character Augustus Gloop meant to portray gluttony. Note that of all the candies and confectioneries within the forest and river, the chocolate river is what destroys Augustus. As Wonka sits back and watches Augustus move towards and into the pipe, he casually begins to eat a chocolate bar cheekily saying, “The suspense is terrible… I hope it will last.” while the crowd of parents and children panic around him. The choice of a chocolate bar, rather than a colorful candy, shows how indulgent and unfazed he is even amidst panic and chaos. Chocolate here brings out the worst in Augustus and in Wonka and commercials like to take part in that as well. The “Dove Senses” commercial posed chocolate as indulgent, luxurious, and tempting, all more positive symbols of sinful behavior. Matt’s first memory of chocolate was when he was about five years old; he had gone inside a convenience store with his mother and, on the way out, had grabbed and stolen a bag of Mars M&M’s. When his mother saw him eating them the in car on the way home, he denied that he had been eating chocolate and was marched straight back to the store to apologize for the theft. To Matt, chocolate has a vivid memory of guilt whereas the other two, Jessica and Andrew, negatively associated it with weight gain. Those who have more negative emotions about eating chocolate generally focus more on their health, dieting, and appearances (Benton 207). They are more likely to feel sick after eating chocolate and more often use a rationale like “to keep my energy levels up” to validate their chocolate consumption. The sinfulness and guilt associated with chocolate is transformed into indulgence, desire, and often lust to help marketers mask negative emotions or feelings from chocolate. You can immediately notice the distinct change of cartoon to CGI M&M people. Although that change does come with technological progression, the M&M men are placed in a modern world where things are not as forgiving or magical. Other M&Ms ads over the past six years have been similar, making their cartoon candy men into snarky, modern characters set in the real world. In the 1980s, the chocolate industry surged as the baby boomer generation became adults and continued to buy chocolate for themselves; “big chocolate” began to target adults with commercials during sports events, daily news programs, and weekly sitcoms (Winters). The target audience of chocolate commercials had grown up and so did their cartoon characters and tones. By the time the twenty-first century came around, commercials for chocolates were targeting both children and adults. More mature variations of chocolate like Dove sprung into the market and found success from a new generation of adults. When asked to recollect the evolution of chocolate marketing, both Jessica and Matt remarked on how many varieties of chocolate products have developed and the rainbow of candy wrapping colors in convenience stores. As the chocolate industry exploded so did the amount of possibilities; “big chocolate” started adding fruity and minty flavors, new textures, and larger sizes of candy bar for consumption. Almost any type of candy bar thought of is on the market today and has moved from its basic consumption during the 1960s and 1970s. “Big chocolate” had no choice when it made its marketing more mature. Its largest consumer group, the baby boomers, had become adults; to make the most profits, “big chocolate” would have to find a way to appeal to them, making chocolate a treat for both adults and children. Mature chocolate ads like the “Dove Senses” commercial usually depict women living luxuriously and indulging in sinful desires. Dove as a product exclusively targets adult women through their marketing as a product that will make women happy and more positive during their days. When asked during interviewing why people like chocolate, both Matt and Andrew expressed that women got more pleasure and consumed more chocolate than men. Although chocolate consumption by men and women is markedly the same, almost all chocolate ads targeting adults specifically target women or have a woman as the primary focus of the ad. With brands like Dove stressing the idea of chocolate for women, women may be physiologically and psychologically more drawn to chocolate than men. Palatable foods with high fat and sugar content like chocolate are most pleasurable when a subject is under some form of psychological stress. Hormonally, women are more often under psychological stress from menstrual cycles, pregnancy, and a higher likelihood for unipolar depression (Briollo and Di Renzo 166). Chocolate craving and consumption becomes more frequent before, during, and after menstrual cycles and also during pregnancy. When asked about the time she ate the most chocolate in her life, Jessica said it was during her first pregnancy; she was craving chocolate all the time and every day. During pregnancy, rapid hormonal changes within the brain strike indicators of stress making the subject crave more palatable foods (Briollo and Di Renzo 170). Chocolate’s pleasurableness to eat and familiarity to women often leaves its mark in cravings. Chocolate consumption during pregnancy has been proven in multiple cases to be beneficial or relatively harmless, but it does boost the mental well-being of pregnant women and reduces stress. Women do find chocolate more pleasurable than men because of natural hormonal changes that induce physiological stress on the brain and body so they often crave chocolate more often than their male counterparts. The endorphins in chocolate reduce stress for both men and women, but more often in women because of physiological stress caused by menstruation and pregnancy. “Big chocolate” targets female consumers because women buy more chocolate than men, not because they consume more chocolate than men. Because of physiological stress, women are more likely to give in to buying chocolate on a craving over men although men and women consume about the same amount of chocolate each year. Advertisements for chocolate are influenced by common beliefs about chocolate’s properties and characteristics. Chocolate does provide stress relief and boosts mood, but often makes people feel guilty for eating it, especially those focused on body image or weight loss. These advertisements target people’s already held beliefs and enhance them making chocolate seem almost lustful, overwhelmingly happy, and for every type of consumer. Chocolate ads have ditched their colorful cartoon imagery and swapped it for dry, realistic humor or sexual chocolate fantasies all because its consumer base began to age. Chocolate marketing has only swollen and spread commonly held beliefs and updated itself to stay current and sell to wider audiences. Matt, Andrew, and Jessica were all interviewed with twenty questions about their experiences, relationships, and reactions towards chocolate. The last question in the interview asked if they had any knowledge of cacao farming or production; all three interviewees had no knowledge of how chocolate is produced, yet could name specific chocolate commercials from their childhood forty or fifty years in the past. Commonly held beliefs about chocolate are informed by marketing and vice versa, but consumers of “big chocolate” know very little about the product they are actually buying. *All names of those interviewed have been changed. Benton, David. “The Biology and Psychology of Chocolate Craving.” Coffee, Tea, Chocolate, and the Brain. Ed. Astrid Nehlig. Boca Raton, FL: CRC, 2004. 205-18. Print. Brillo, Eleonora, and Gian Carlo Di Renzo. “Chocolate, Cocoa and Women’s Health.”Chocolate and Health: Chemistry, Nutrition and Therapy. By Philip K. Wilson. London: Royal Society of Chemistry, 2015. 160-72. Print. Wenk, Gary L. “Euphoria, Depression, & Madness.” Your Brain on Food: How Chemicals Control Your Thoughts and Feelings. Oxford: Oxford UP, 2015. N. pag. Print. Winters, Patricia. “Chocolate Marketing No Longer Kids’ Stuff.” Advertising Age 57.31 (1986): 22. Web. When you traverse around a convenient store for your necessary groceries and finally make it to the front counter, you begin to notice a bright array of sugary delights staring upwards at you as you wait lethargically in line for the cashier to call “NEXT!” You begin to think, “well, I am craving something sweet…and that’s not too expensive” before picking up a chocolate bar and adding it to your tab. But have you ever stopped to wonder why it may be that the candy isle is so conveniently located at the check-out around waist-level when it already has a bigger isle devoted to it right in the back of the store? Coincidence? Well it is surely far from it. A candy selection at the checkout counter of a generic convenient store. Notice the placement of the isle and physical height. In this blog post, a discussion will arise pertaining to the varying types of chocolate bars sold at a convenient store such as CVS, the history and contents of this selection of chocolate, and all in relation to contemporary issues in sugar and obesity in youth, harkening back to the advent in the rise of sugar amidst the chocolate industry historically. Among the selection of candy bars sold at CVS there include, but are not limited to: Reese’s, Twix, Hershey’s chocolate bar, M&Ms, Butterfinger, Kit Kat, 3 Musketeers, and the like. Such inexpensive candy bars tend to sell at a price at or around $1 USD. Interestingly enough, although there seems to be a wide selection of candy bars at these check-out counters, oftentimes all these bars fall under roughly three major chocolate companies: Hershey’s, Mars, and Nestle. After Henry Nestle’s creation of milk chocolate in 1875, the chocolate conglomerate race began. In the 1920s, competition began to run starkly between Hershey’s and Mars with Forest Mar’s cheap but selling creation of the Milky Way. When customers would approach the candy counter back then and see a flat Hershey’s bar adjacent to a bulging, thick Milky Way, they surely chose the latter, raising sales for Hershey’s competitor (Brenner). What was interesting about Mar’s company as well as the big chocolate companies back then, was that even though they were putting out over 20 million candy bars, their infrastructures didn’t actually appear on the outside as manufacturing plants. Instead, they adopted cultural architectural styles, and had magnificent grass lawns; in essence, an emulation of a utopia (Brenner). But competition really wasn’t too strong between Hershey’s and Mars all the time: when Hershey’s was starting out with Mars, Mars was actually helping sales of the former by purchasing its chocolate coating and Hershey’s would make specific chocolate coatings for different Mars bars. Unfortunately, candy spies arose amidst these companies, with workers disguising themselves to find secrets about the chocolate making of these large companies, thereby contributing to a rise in competition (Brenner). Soon these companies realized they could add other materials inside their candy bars such as nougat or even peanut butter, racing each other with novel inventions and mass or bulk production of chocolate. And with industrialization underway by the late 1800s, culinary modernism–a period of processed and bulk production of food (especially cacao)–was prominent entering into the 20th century (Laudan, 2001). Representing these industrial manufacturing plants as utopias and embodying American values, companies like Hershey’s would be found producing commercials that represent core American values and common societal motifs. Yet not only was industrialization helping these companies sell their products, but a steep rise in sugar consumption was also attracting customers. In 1830-1840, with a drop in the price of sugar by over 30%, the working and middle class were beginning to outnumber consumption rates over the wealthy, with sugar being added to most foods, especially tea and chocolate products. Children at young ages were now being accustomed to larger caloric intakes of sugar, as sugar began to represent, and continues to represent, the most significant upward production curve of any other food item on the market over the course of several centuries (Mintz, p. 142-145; Martin, Lecture 7). Consequently, with a rise in cacao production, the manufacturing of bulk or processed candy, and higher sugar intake in these processed items, major ethical issues have arisen. As a matter of fact, when looking at the nutritional facts and ingredients in a Hershey’s candy bar, one may be surprised to find out that a generic Hershey’s Chocolate Bar only has roughly 11% cacao content. If that is the case, then one may ask what the remaining contents are; the answer being mostly milk and sugar. Simply put, the chocolate bars you may find at a store like CVS may be considered mere imposters or cheats of chocolate bars when you consider that a purchase of such a bar that brands itself as a “chocolate” bar only has at or around a tenth of chocolate in all [See: Washington Post below]. More frightening is the fact that such bars contain nearly the entire daily recommended percentage value of sugar intake and over a fifth of the daily amount of fat intake As a result, it is noteworthy to inquire as to why these candy bars are being purchased in such high quantities, and as to who these companies attract as their target audiences. Going back to an observation made in the introduction of this discussion, it should be reiterated that not only is the candy isle located both in the back of the store and at the check-out counter, but that it is also conveniently placed at waist level: keyword being convenient. Convenient for whom? Children! 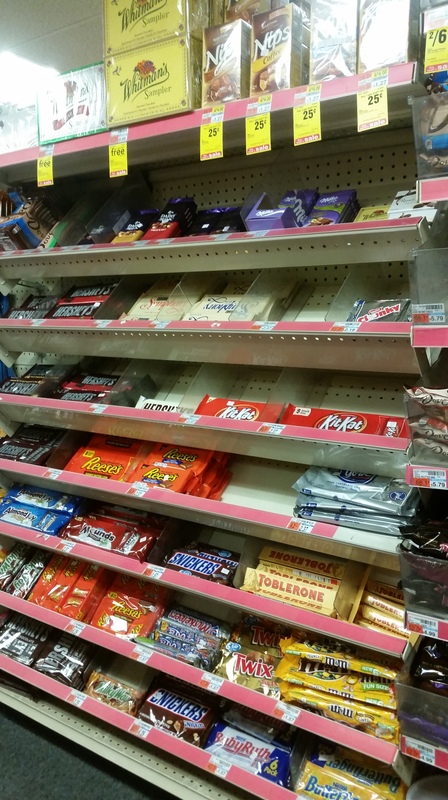 The wider selection of the back-of-the-store candy isle can be found stocked with finer chocolates such as Lint Bars or Ghirardelli, but take notice that the front checkout counter merely contains your $1 candy bars supplied by Hershey’s, Mars, and Nestle. And this all makes sense now when shining the light on youth. Given the sweet tooth common among children, Lint Bars and 72% cacao may not be enough for their desperate taste buds. Instead, they may desire the high, sugary content of a Reese’s bar or M&Ms, flashing over 24 grams of sugar. Yet oftentimes a caring parent avoids the candy isle. But what he/she cannot avoid is the child’s stare at the array of colorful candy bars as mom/dad pulls out the credit card to pay for the groceries. Clearly, manufacturing companies like Mars team up with store owners to win over their target audiences: youth. Colorful candy wrappers and animated characters, teamed up with a beautifully placed, waist-line presence of candy bars, mom and dad cannot help but cease the wining and begging of their children, ultimately conceding to the purchase of a sugar-packed candy bar from one of the top chocolate conglomerates. The animated characters that candy companies utilize to help attract youth. As a result, significant ethical issues have arisen, especially over the current decade and continuing on into the present: namely, in relation to sugar consumption and child obesity. As the documentary film “Fed Up” mentions, “They’re in business to make money, not to make America healthy” (“Fed Up” https://www.youtube.com/watch?v=UVX6_LzX4mM ). What is more interesting is to find recent research studies supporting the findings that the human brain reacts similarly to sugar intake as it does to drugs such as cocaine (Serge, Karine, and Youna, 2013). The reward pathway in the brain lights up nearly identical to that of the reaction to the intake of hard drugs. In fact, the dopamine reward pathway of someone who consumes sugar has more activity than someone who is obese, and the person who is obese shows a similarly dulled dopamine response as someone who is addicted to drugs (http://mic.com/articles/88015/what-happens-to-your-brain-on-sugar-explained-by-science#.52zWKxwvS). What this shows is that sugar intake can be a very dangerous aspect of human culture, but more so, that with the rise in sugar production and consumption significantly, and with a target audience of youth for candy companies, issues are arising. Looking back at the 1800s, the average American consumer consumed what is now equivalent to the amount of sugar in one can of soda, but during the length of five days. Now in the second millennium, that 5-day intake has risen to over fifteen cans of soda or nearly 20 times the amount of sugar intake. According to the Center for Disease Control (CDC), obesity rates in youth ages 6-11 years old rose from 7% (1980) to 18% (2012), almost three times the amount, tagging almost one in five children as obese, and one third of youth and adolescence combined falling under the category of obesity. With cheap prices, flashy advertising, and high sugar/calorie contents of these candy bars, the rise in obesity in youth and teens is strongly increasing, posing risks for cancer, cardiovascular health, diabetes, and obesity during adulthood, which may further affect offspring and their further risk for obesity and related health problems (http://www.cdc.gov/healthyschools/obesity/facts.htm). In summary, current society is posed with a vital issue at hand: obesity. And much of this problem can lend itself to the big candy companies who continue to contribute significantly to the rise in production and consumption of sugar. Adding to their sales repertoire, flashy candy wrappers, color cartoon mascots, joyful commercial advertisements, and conveniently placed candy at convenient stores for youth to run into, candy companies and stores like CVS are only contributing to the problem. The CDC points out that statistics for child and adolescent obesity are rapidly increasing and posing risks for adulthood and future generations. Documentary films such as “Fed Up” attempt to expose the sugar industry and the issues at hand. And parents claim to be trying hard to provide healthy alternatives to their children. Yet issues are still arising and issues will continue to arise until the conglomerates are staunchly confronted. Until then, they may hide behind flashy advertisements and commercials that appear to embody true American values, concealing the truth of crushing these values with issues like obesity. Ahmed, Serge H., Karine Guillem, and Youna Vandaele. “Sugar addiction: pushing the drug-sugar analogy to the limit.” Current Opinion in Clinical Nutrition & Metabolic Care 16.4 (2013): 434-439. Brenner, Joel. 2000. The Emperors of Chocolate: Inside the Secret World of Hershey and Mars. chapters 5, 13 pp. 49-69, 179-194. “Chocolate By the Numbers.” Washington Post. The Washington Post, n.d. Web. 03 May 2016. Kate, Nina. “The Cacao And Cognition Connection | HoneyColony.” HoneyColony. N.p., 12 Mar. 2013. Web. 03 May 2016. Laudan, Rachel. “A Plea for Culinary Modernism: Why We Should Love New, Fast, Processed Food”. Gastronomica 1.1 (2001): 36–44. The Chocolate, Culture, and the Politics of Food course ended with a very interesting question: What is the future of chocolate? We would like to think that chocolate has a future, especially in the it-should-always-be-available-for-my-consumption sense, but if you have ever really wondered about the future of chocolate, this report might shed some light on the long-term sustainability of cacao and the livelihood of farmers who do their best to meet the growing demand in the age of global warming and projected climate change. Note: Cacao and cocoa will be used interchangeably for the purposes of this report. It is probably the most uncontested fact about cacao: Africa is its major supplier. Cote d’Ivoire and Ghana alone produce over 50% of the world’s cacao. When the nations of Nigeria and Cameroon are included in this unbalanced equation, the total contribution to cacao production stands at 70% (Intergovernmental Panel on Climate Change (IPCC); Schmitz & Shapiro, 2012; Barometer Consortium; Laderach, Martinez-Valle, Schroth, & Castro, 2013). In other words, there is a lot of chocolate at stake in Africa! And yet, the “entire African continent is the least studied region in terms of ecosystem dynamics and climate variability” (Anyah & Qiu, 2012, p.347). This is even after projections and the Global Climate Model (GCM) predict Africa to be in a very precarious position following extreme weather patterns, including long-term droughts (IPCC). This is especially troubling considering that the majority of Africa’s crops are rain-fed (Anyah et al., 2012). Connolly, Boutin, and Smit (2015) describe a 20-50% drop in cacao yield by 2050. While we cannot control the weather or be certain about cacao yield predictions, researchers have offered various solutions to buffer some of the impacts from climate change and global warming. This report will present some of these solutions and highlight a case study in Bahia, Brazil, where a resurgence in cacao production is occurring-this, after having experienced a crippling blow. The spotlight needs to be on Africa, especially its biggest cacao-producing countries and states, to ensure the future of cacao, its farmers, and ultimately chocolate. According to Hamzat, Olaiya, Sanusi, & Adedeji (2006), the survival of cacao in West Africa up till now is entirely due to the Forastero Amazon strain introduced by Posnette (a plant pathologist credited with saving the West African cocoa industry)* and the West African Cocoa Research Institute (WASRI) in the mid-20th century (p.18). One of the major issues that arise from an agriculture-based economy are pests and diseases which can devastate crops. Black Pod Disease and Cocoa Swollen Shoot Disease (CSSV) are the two prominent diseases affecting the cacao crop in western Africa (Hamzat et al., 2006). Farm-maintenance management practices have also been known to inadvertently attract pests (i.e. brown and black cocoa mirids). It might seem like a terrible paradox, but food scarcity is also a major problem in an agriculture-based economy like western Africa’s, considering that “cocoa occupies 2.4 million hectares in Cote d’Ivoire and 1.5 million in Ghana, more than in any other country in the world” (Laderach et al., 2013, p.842). Farmers in this region usually do not combine and/or rotate crops and are left without food supply, detrimentally affecting their nutritional intake (Schmitz et al., 2012). The fact that most cacao farmers are producing on a small-scale also comes into play: in Nigeria, small holdings of farmers account for 60% of Nigeria’s total (cacao) output. Most of these farmers are in remote, rural areas and do not have access to the best seedlings or the equipment/infrastructure needed to produce higher, better quality yield (Hamzat et al., 2006). According to Hamzat et al. (2006), these farmers have a difficult time obtaining credit to make the necessary improvements. This might not appear to be a deal breaker considering that most small cacao farmers have been in business for years without high-tech machinery assisting them, but Schmitz & Shapiro (2012) state that modern farming techniques can make a drastic difference; at least 1,000 kilograms per hectare or more. At the same time, the next generation of would-be (cacao) farmers are leaving the rural areas en masse (Hamzat et al., 2006). The rural-to-urban migration is largely influenced by the fluctuating price of cocoa and the fact that cocoa is very labor intensive and the crop itself is fickle and susceptible to disease (Hamzat et al., 2006). This situation results in an aging farmer population who are less willing to adapt their farming techniques to produce more cacao and are looking to leaving the cacao industry altogether. West Africa’s history with cacao is not particularly rosy either- the use of child slave labor uncovered as late as 2000’s, has blacklisted the region. Photo Credit: Schmitz, H. & Shapiro, H.Y. (2012). Africa will also have to contend with a projected population boom (Miller, Waha, Bondeau, Heinke (2014). This may interrupt the cacao industry in that farmers will be forced to grow food, rather than their cash crop. The surge in population might also alter farming completely in that water will become an even more precious resource not to be wasted on cacao farms. Together, these social, economic, and technical issues will be exacerbated with the addition of above-average climate change for the region in the 21st century. The sustainability of cacao is a topic at the forefront of Big Chocolate, namely Mars and Hershey. Schmitz & Shapiro (2012), scientists working on behalf of Mars, quantify the expected increase in world-wide chocolate demand: “currently, farmers produce approximately 3.7 million metric tons of cocoa, where expected demand is said to reach over 4 million metric tons of cocoa by 2020 (p.62-63). Due in part to this pressing timeline, Mars has connected with scientists, universities, the World Cocoa Foundation (WCF) and even the U.S. Department of Agriculture (USDA) to essentially “save” chocolate. Mars and Hershey have both committed to buying 100% of their cacao supply from farms using sustainable practices by 2020. To qualify “sustainable,” Mars and Hershey have partnered with The Fair Trade Foundation. Of course, there are many equity (and other) issues surrounding Fair Trade (see Prof. Martin’s April 6, 2016 lecture). For the past 50 years, Hershey has bought the bulk of their cacao from Ghana and Cote d’Ivoire (Hershey Cocoa Sustainability Strategy). These big chocolate corporations have provided funding to organizations like Fair Trade to “help cocoa farmers improve their processes, yield, and profits” (DesMarais, 2014). While cocoa farmers in Ghana and Cote d’Ivoire are benefitting from the help extended to them by Big Chocolate, Hershey and Mars have plenty to lose if the cocoa crop is neglected in this region, specifically in terms of supply. Mars and Hershey (among other Big Five chocolate actors) have been vying the Chinese market for the last few years (Allen, 2009), and now, the demand from these new markets has presented more urgency regarding the sustainability of cacao in western Africa. Is cacao’s future in the hands of science? The World Cocoa Foundation estimates that 30-40% of the cacao crop is lost to pests and disease. With a race against time, scientists and researchers have been engineering a new super breed of cacao. With a projected rise in temperature by 2’C (or approximately 35’F) in western Africa, scientists are in search of a drought-tolerant, disease-immune cacao strain. So far, Mars and the USDA have sequenced the cacao genome in an attempt to breed hardier trees (Schmitz & Shapiro, 2012, p. 63). Critics of this super breed are worried about the flavor; CCN51, is said to be resistant to witches’ broom, but according to certain palettes (i.e. The C-spot), this breed is described as “weak basal cocoa with thin fruit overlay; lead and wood shavings; astringent and acidic pulp; quite bitter” (Schatzker, 2014). If we can appreciate anything about chocolate, it is its flavor profile and depth, making the problem of taste all the more relevant. Schatzker (2014) suggests that Big Chocolate might not be so concerned with flavor given that they can use fillers to fortify their chocolate (e.g. vegetable fat, milk, vanilla, flavor chemicals). So, to answer the question if cacao’s future is in the hands of science-certainly Big Chocolate seems to think so. Credit: Schmitz, H. & Shapiro, H.Y. (2012). If the history of the coffee crop can teach us anything, however, it is that science does not always offer the best alternative. Arabica coffee, like the cacao tree, grows best under shade (they are understory trees), but when a hybrid (that could tolerate the sun) was introduced to boost the coffee bean yield, many environmental issues arose, among these: The use of herbicides and fertilizer (which led to contamination of groundwater), deforestation, and the trees having to be replaced more often (Craves, 2006). Irrigation water required will increase. Scientists, at times working for Big Chocolate, hope to address these climate issues by breeding superior genotypes of Theobroma cacao. It is in the interest of the Big Five to keep up research efforts in western Africa as most of their cacao comes from this region. Again, for the past fifty years or so, Hershey and Mars have benefitted from the region, amassing fortunes; it is time they give back to the land and people that have given up so much. But keeping pace with increased demand in chocolate is not just their problem. Indeed, there are others working on behalf of chocolate. The International Group for the Genetic Improvement of Cocoa (INGENIC) has sprouted out of concern for the future of cacao and were established to collaborate and coordinate on cocoa breeding and management of germplasm resources (INGENIC). Still others, like members of the Cocoa Barometer Organization, are turning to raising awareness and education to reach consumers and farmers alike. Small-scale farmers in western Africa, already experiencing the impacts of climate change, seek some certainty for their very uncertain future, whether in the form of science or other. Brazilian cacao farmers call it “cabruca.” It is their traditional method of farming cacao-using the shade of other food crop and timber trees, they have maximized the use of the land. Another name for this form of farming is known as mixed agroforestry systems. This method of farming is known to improve the water-holding capacity of the trees (Schmitz & Shapiro, 2012). It is sustainable and environmentally-friendly because 1. It provides corridors for wildlife increasing biodiversity; 2. The trees and surrounding plants capture more carbon; 3. It generally requires less water; and 4. More of the (dwindling) forest is preserved (Sambuichi, Vidal, Piasentin, Jardim, Viana, Menezes, Mello, Ahnert & Baligar, 2012; Schroth, Faria, Araujo, Bede, Van Bael, Cassano, Oliveira, & Delabie, 2011). Bahia is also currently experimenting with a second method: planting cacao trees at higher altitudes, out of pests’ normal range (Schmitz & Shapiro, 2012). In the 1980’s, this region of Brazil experienced a devastating blow to their prized cacao crop-a reduction of 80% in cacao yield-collapsing the cacao economy (Schmitz & Shapiro, 2012). Limited genetic variation led to a near wipeout of cacao trees in the area (most succumbed to witches’ broom). Today, Bahia, has reemerged as a contender in the cacao industry and is recognized for its flavorful cacao beans. In light of global warming, researchers have begun to explore the potential “lessons-learned” from Bahia that could be applied to western Africa; however, most agree that site-specific strategies are needed. Although this blog attempted to touch on the current situation regarding cacao in West Africa and cover a wide range of potential climate change scenarios projected for this region, there are probably more questions than answers. In obtaining feedback for this paper, there was a comment about global warming and climate change involving a lot of speculation. And in truth, no one can really know the impacts climate change will bring. What we can stand firm on is the fact that climate change will happen. In other words, it is not a question of if, but when. West Africa has become a living lab of sorts, but a question one might have about cacao coming from this specific region may involve the major chocolate buyers. Should we care about Big Chocolate like Hershey and Mars running out of supply? The simple answer is yes. The livelihoods of so many farmers depend on corporations like Mars to buy their product, and if organizations like Fair Trade can lead the sustainability efforts, farmers will benefit. The places cacao is sourced from may change-according to NOAA cacao can only grow within 20’ north and south of the equator today, but in the future, higher altitudes may be called for-but terroir and consistent quality cacao will always be a good selling point. It is in everyone’s best interested to be invested in the future of chocolate, cacao farmers, and the West African region in particular. Finally, it was important to introduce the Bahia case study to demonstrate how one region, in the midst of global warming projections and a near wipeout under the belts, are still finding ways to minimize their ecological footprint. We do not have to wait for 2020 or 2050 to arrive, the future of chocolate is now. Allen, L.L. (2009). Chocolate fortunes: The battle for the hearts, minds, and wallets of China’s consumers. New York: AMACOM. Anti-Slavery International (2004). The Cocoa Industry in West Africa: A history of exploitation. Anyah, R.O. & Qiu, W. (2012). Characteristic 20th and 21st century precipitation and temperature patterns and changes over the Greater Horn of Africa. International Journal of Climatology, 32. Connolly-Boutin, L., & Smit, B. (2016). Climate change, food security, and livelihoods in sub-Saharan Africa. Regional Environmental Change, 16. Hamzat, R.A., Olaiya, A.O., Sanusi, R.A., & Adedeji, A.R. (2006). State of cocoa growing, quality and research in Nigeria: Need for intervention. Presented at The Biannual Partnership Programme of the World Cocoa Foundation. Laderach, P., Martinez-Valle, A., Schroth, G., & Castro, N. (2012). Predicting the future climatic suitability for cocoa farming of the world’s leading producer countries, Ghana and Cote d’Ivoire. Climatic Change, 119. Muller, C., Waha, K. Bondeau, A. & Heinke, J. (2014). Hotspots of climate change impacts in sub-Saharan Africa and implications for adaptation and development. Global Change Biology, 20. Sambuichi, R. H. R., Vidal, D.B., Piasentin, F.B., Jardim, J.G., Viana, T.G., Menezes, A.A., Mello, D.L.N., Ahnert, D. & Baligar, V.C. (2012). Cabruca agroforests in southern Bahia, Brazil: Tree component, management practices and tree species conservation. Biodiversity Conservation, 21. Schmitz, H. & Shapiro, H.Y. (2012). The future of chocolate. Scientific American. Schroth, G., Faria, D., Araujo, M., Bede, L., Van Bael, S. A., Cassano, C.R., Oliveira, L.C., & Delabie, J.H.C. (2010). Conservation in tropical landscape mosaics: The case of the cacao landscape of southern Bahia, Brazil. Biodiversity Conservation, 20. The chocolate selection at any store indicates who their consumers are, what the most popular products are, and the overall price will indicate its purchase by the consumer. I have chosen to investigate the chocolate selection at Consumer Value Stores, better known as CVS, and Cardullo’s Gourmet Shoppe. The two shops are conveniently across the street from each other in Harvard square. The location of CVS and Cardullo’s is important to mention because that may indicate what products they have and the price points of each product. I chose the CVS location in Harvard square believing there may be some higher end options offered here due to the location and demand of Harvard square. I selected Cardullo’s as they are gourmet shoppe with foreign and unknown brands of chocolate. Cardullo’s is a specialty shop and they pride themselves on providing an array of products from all over the world. You walk into their shop and you can buy jam from Greece, honey from Zambia, wine from California, bread from Somerville, and crackers from Latvia. When I think of Cardullo’s, I begin to have images of chocolates from far away, companies and brands I have never encountered before, and high prices. I generally would go here if I am looking for something new to try or window shopping to see what new items they have. As for CVS, in my mind they are a one stop shop. I can buy toiletry items, have my prescription filled, and purchase chocolate all at the same time. I believe they have fair and equivalent prices for all of their products, so I generally don’t worry about getting the best deal when I shop here. This is a store where I can find all the popular brands, from food, to medications, to paper towels, and a CVS equivalent of the same brand name product. With the use of CVS yellow sticker prices indicating sale items, it is easy to locate the cheapest product when searching for the best deal. All the chocolate you find at CVS is a popular brand name and the CVS brand chocolate. 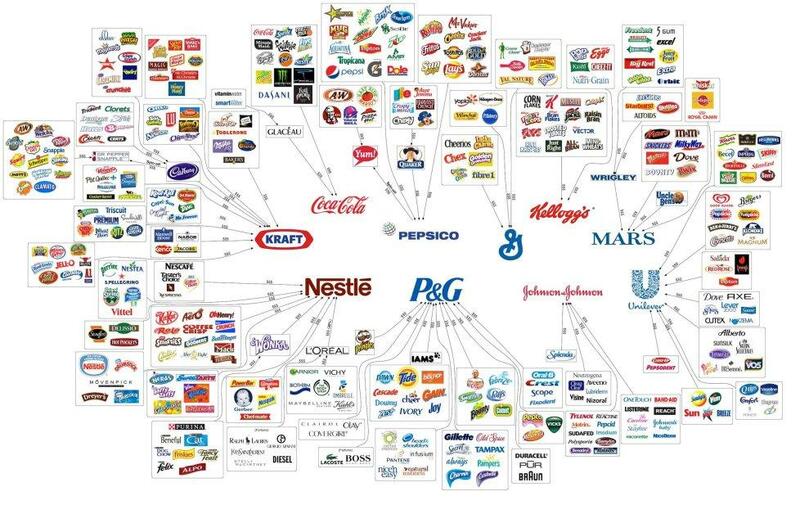 From the Nestle company, I could easily locate KitKat, Crunch, and Butterfinger chocolates. The Mars company selection consisted of M&M’s, Snickers, Dove, Twix, Milky Way, and Mars chocolate. Cadbury, Milka, and Toblerone from the Kraft Company. Throughout the chocolate aisle, I could find these chocolates in bar form, mini snack size, bite size, and in bags (bulk). There were two other prominent chocolate bars to select from, Lindt and Ghirardelli, that are not associated with the large corporations mentioned above. For Ghirardelli, each bar variety that was displayed there was a CVS bar to match it. Not only were the flavors the same, but the packaging style and design are very similar. The bars were not the only ones replicated, but the small bag that contains 12 pieces of small Ghirardelli squares, that can be found in individual packing, was also replicated. As for Lindt, the same thing could be found – for every bar flavor, you could find the CVS brand directly underneath it. Similar to Ghirardelli, the small bag that contains about twenty-five Lindt chocolate truffles was replicated and found beneath it. 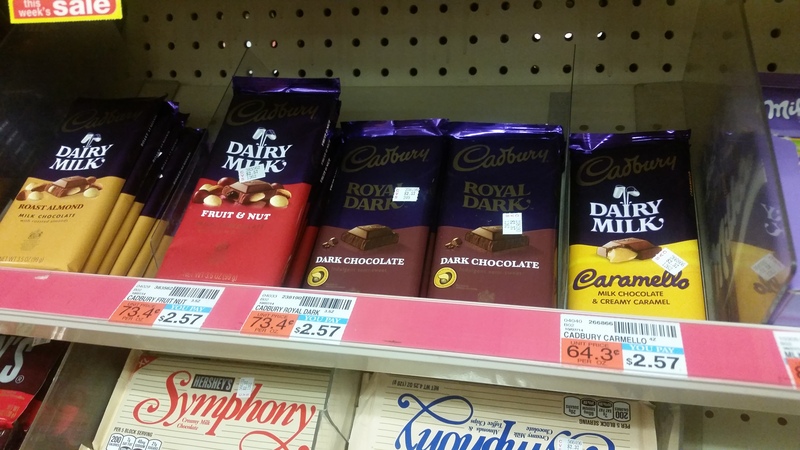 Even though the CVS brand could be located beneath these chocolates you really have to search for it, as the display makes these choices close to the ground. 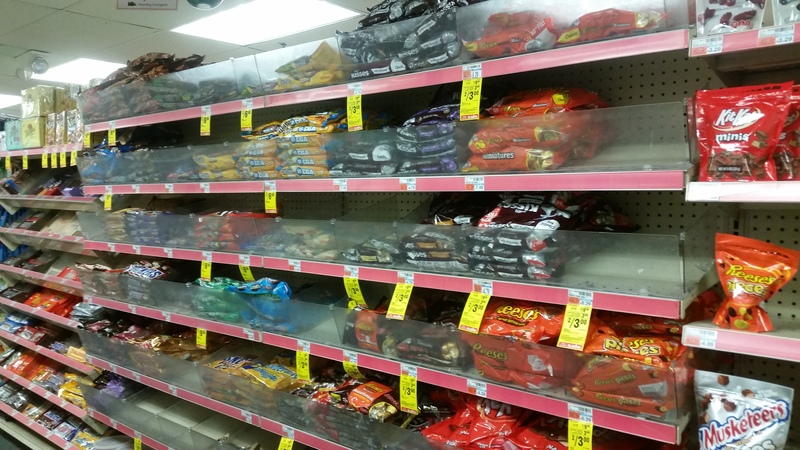 When searching for chocolate at CVS you are overwhelmed with the choices present and it would be rare that the shelves closer to the ground would be immediately located. The selection of CVS chocolate was limited to the Ghirardelli and Lindt as I described above, except for the few packages I saw of chocolate covered fruit, chocolate covered nuts, mint chocolate bites. The chocolate selection at the CVS registers are easily located so while you are waiting in line, you can see the chocolate selection and ponder purchasing a last minute treat. Even at the self-checkout registers there is a small chocolate, candy, and gum rack for very last minute purchases while you are checking your items out. The chocolate choices that can be found here are the most popular purchases such as Snickers, Reese’s, and KitKat. Cardullo’s has a very wide selection of chocolate from all over the world. They have small batch, craft chocolate maker, and chocolatier chocolates such as Francois Pralus pure origin bars and Chocolat Bonnat single origin bars. They carry craft chocolate makers such as Taza, Vosges, and Chuao. Craft chocolate makers are are companies that creates small batches of chocolate from bean to bar (Coe & Coe 2013). Cardullo’s also carries the Big Five chocolates such as Toblerone, KitKat, D’Or, and Cadbury. Then there are is the popular Belgian chocolate companies such as Godiva, Nehaus, and Dolfin that are regularly in stock. Looking around at Cardullo’s selections, I was most attracted to the packaging of Francois Pralus pure origin bars. The front of the bar clearly and in the largest text states the country of origin for the cacao used in the bar. Directly under the country’s name you can immediately see what type of cacao was used in preparing this chocolate bar. Third, the chocolate bar also has the longitude and latitude of the location of the farm where the beans are grown! The bars seen at Cardullo’s indicates what we have learned in class, that cacao generally is grown 20 degrees above and below the equator (Presilla 2009:9). The packaging also has a map of the world with an indication as to where this cacao come from to give the consumer a better idea of how far the cacao farm is from your local grocer. I could imagine this map as a tool to indicate how far the chocolate is coming from and why the price costs as much as it does. This was the most expensive bar I could find at Cardullo’s, with a price of $11.99! Depending on what kind of chocolate is being displayed, the display can vary at CVS. All of the chocolates that come in bags with multiple small size candy bars can be found in silver metal baskets. The individual chocolate bars are found on the general shelving, slanted at a 30 degree angle. This angle provides the consumer first with the type of chocolate rather than the brand name of the chocolate. This is because your eyes start at the bottom of the bar and move up to the top of the bar where the brand name is positioned. The way CVS has their chocolate organized is by the most popular at eye level. Their shelving consists of five rows, and the second and third shelves have the most popular brands occupying that space. These shelves are prime at the prime height for most consumers, therefore their eyes are attracted to these shelves first and they generally will purchase a product from here. The other shelves hold the other less popular items and the CVS brand items. As a consumer, I personally did not think much about what is being used to display the chocolate at CVS prior to this research. However, when comparing it to Cardullo’s, it is now more striking to me how plain and unattractive the displays are for chocolate at CVS. For chocolate that is known as the the food of the gods (Coe & Coe 2013)! The display at Cardullo’s was slightly more attractive, and that was not on the part of the shop, it is on the part of the product. Many of the packaging from the different companies were bright, attractive, and stood out from each other. Since the packaging was more attractive, this is what made the display more attractive. What was interesting about the Lindt, Ghirardelli, and CVS knock-off brand of both of these chocolates, they were located in the front of the store. 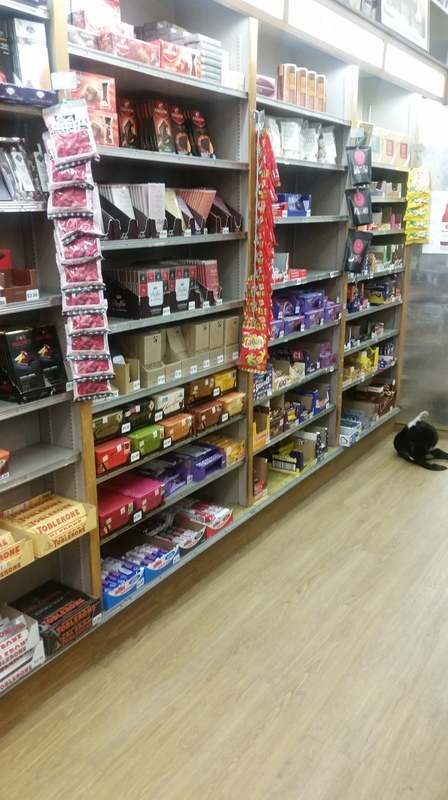 The display at the front of the store did start off the chocolate aisle, but it is also a prime place for the store clerks to keep an eye on their most expensive chocolate. At Cardullo’s, the display of chocolate is very different than what I saw in CVS. First, you find no chocolates in bags. Almost all the chocolate is sold individually and in bar form only. Second, all the chocolate bars were kept in their original manufacturing boxes. These boxes were was used to prop the chocolate up, price of the chocolate, and to ensure the company’s logo is accurately displayed. I did notice some of the shelves did have a black, sleek, metal shelving unit in them, where bars who did not have manufacturing boxes were displayed on. However, this was not common. What was more interesting about these chocolate bars, was the fact that they contained no prices on them. I personally was shocked to discover that Cardullo’s carries the general Kraft, Mars, and Nestle brands along with the higher end chocolates. My perceptions of this shop is of new foreign brands with high prices. 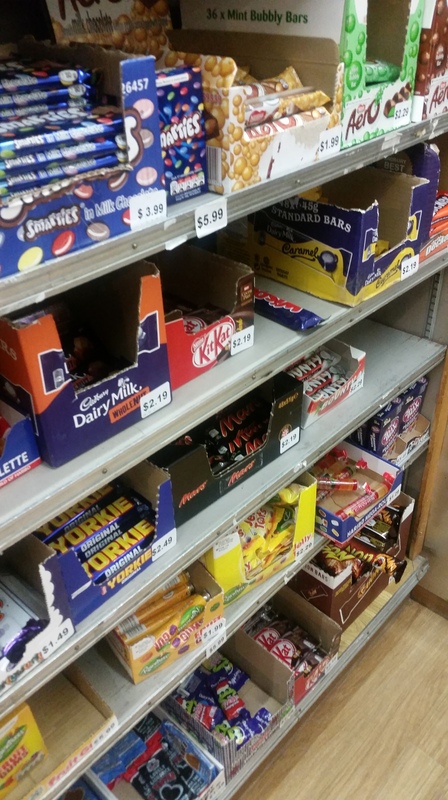 I also stick to one area of their chocolate wall and never wander down the aisle enough to see what else they sell. Since the checkout area at Cardullo’s is small, I have not found any chocolate that can be purchased last minute at the register. I believe this says something about Cardullo’s general customers, they have the luxury of time to make a full decision before checking out. Cardullo’s is a place where many customers have in mind what they would like to purchase and know their selection is very unique. You cannot walk into this store and buy anything you need, like you can at CVS. However, what you can find at the register is small pocket candies and sticks of marzipan for last minute purchases. The price for an individual chocolate bar varied from $1.99 – $4.19 depending on the brand, flavor, and size. The prices at CVS are easy to read and understand with clear labels. As I mentioned above, there are also yellow price tags indicated sales and promotions throughout the chocolate aisle. If a price could not be located on a chocolate product, I could go to the price check machine at the front of the store to find the price. Overall, the pricing at CVS is easy to read, accurately placed, and a great customer value. The most expensive bar chocolate I could find at CVS was Ghirardelli chocolate at $4.19 for a single bar. CVS brand, which is a replica of Ghirardelli bar was selling for $3.19 with almost exact packaging. At Cardullo’s some of the bars of chocolate are easily accessible and labeled with prices. However, it seems that some of the more expensive chocolates do not have their prices clearly labeled. Some of the bars either had no price on them or they were on the back of the bar. Here I feel intimidated going to the cashier to ask them the price of a chocolate bar. If I do have the guts to do it, I try to control my emotions as much as I can and brace myself for an elaborate price for a product that is unknown to me. I feel if I walk in here I should know I am going to pay high prices and should not care about the price of it at all. CVS is the type of store where I would not be intimidated to go to the cashier and ask for a price check. Cardullo’s, on the other hand, is a store where I would rather not approach the cashier and ask them for a price check. If I do happen to have gathered the courage, I would mentally prepare myself to control my emotions when I hear the price. This may sound extreme, but Cardullo’s is not a value store and many of their items are priced high. What I found most interesting as I was doing my research, CVS was selling Cadbury chocolate for a higher price than Cardullo’s was! The price difference was about 30 cents, but still important difference to note. One would think that purchasing chocolate at CVS would be the cheapest and best way to go, but this case proved otherwise! After a thorough analysis of the chocolate selection at CVS I believe that their chocolate is branded, packaged, and priced for the average consumer of chocolate. Prior to this class, I would have been perfectly fine purchasing chocolate from CVS, whether from the Big Five or CVS brand as they generally had the best prices. CVS chocolate is for the consumer who may lack time and would need to purchase their chocolate, while running other errands, instead of going to a speciality shop. CVS chocolate is for the consumer who may lack finances to purchase any chocolate that is over $4.50, so they are limited to what they may consume. Additionally, offering chocolate in bulk, bags, is an ideal product for many consumers who believe they are getting a deal when buying a large quantity of items. Cardullo’s is a shop that carries many imported goods as well as locally produced goods. They cater to the consumer who likes to purchase foreign goods, possibly a consumer who misses a certain product from home. Or possibly for a consumer who once travelled to a specific place and wants to enjoy those products again in their own home. Or for a consumer who has never travelled to such a destination, but can have a try of it through their foods. What ever the case, I see this as a store who promises fond memories for the consumer who purchases their goods. 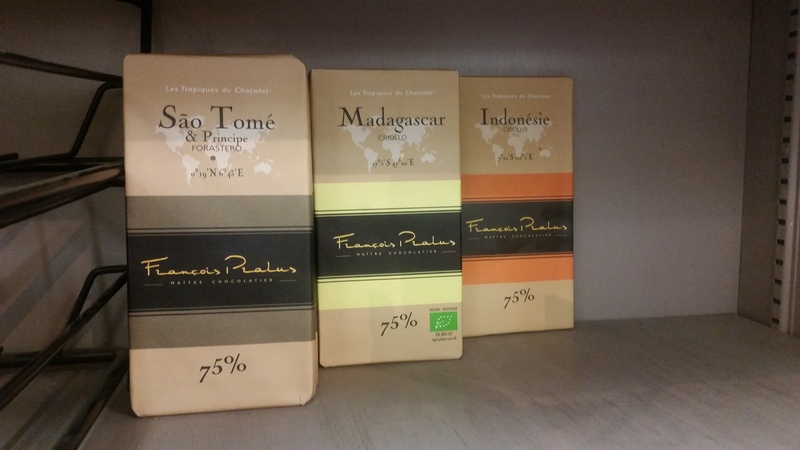 Francois Pralus, the bar from Sao Tome and Principe, is made with Forastero chocolate. As we have learned and discussed in class, Forastero is the type of cacao that is used to make 90% of all chocolate consumed today (Presilla 2009:72). With that in mind, for a bar that costs $11.99 I am not sure it is worth it to purchase and consume a bulk cacao variety for that price. Chocolate has been transformed dramatically over the years through hybridization or creolization. Hybridization or creolization is, a combination of multiple cultures to create a new and unique culture. This is evident in chocolate in America as we can see the addition of ingredients only palatable to the American consumers such as peanut butter. “Entirely new, creolized culture was taking form that partook elements from both cultures …” (Coe & Coe 2013:113). At Cardullo’s you can see the wide array of hybridization of chocolate with many unique choices. Chuao chocolate was the brand that stood out to me the most that had such a grand display of hybridization of chocolate. They had a selection of chocolate potato chips, popcorn chocolate, rocky road chocolate, s’more chocolate, cinnamon cereal, and so much more! 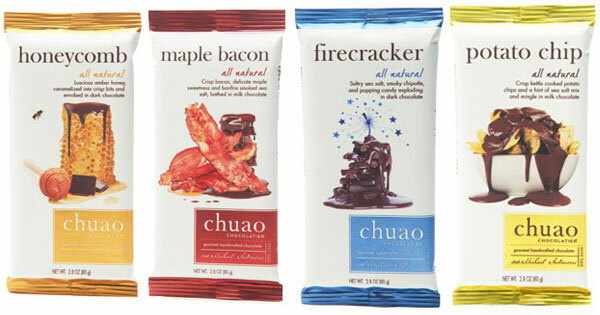 As a matter of fact, I could not locate a single plain chocolate bar from Chuao company! With the varying types they had to offer, it is hard not to notice these. While at CVS, you can see the hybridization as well, but not with as unique flavors Cardullo’s is offering. Peanut butter was the most common additional ingredient added to the chocolate that could be found at CVS. In second, caramel was found to be the additional ingredient in many chocolate bars. This small variety of hybrid chocolate is uninspiring and uniform. If a consumer was shopping for chocolate at CVS and looking for something new to try, CVS would not be able to provide that variety. In conclusion, CVS provides the popular companies chocolates at a low price, with low variety. While at Cardullo’s they provide not only the bean to farm chocolate, but also popular companies, all on the same shelf! If you are looking for something new to try, stop at Cardullo’s while in Harvard square. If you are looking for the typical American chocolate, stop at CVS to purchase your chocolate. I would like to make one last point of my research – My research at CVS and Cardullo’s may not be accurate of their general display, stocking techniques, or general product variety. A majority of my research was completed in a two day period, a very short window of time. I want to take a moment to acknowledge that I may have been at their stores on an empty day, prior to shipment arriving. This could have skewed my research and some points discussed in this post. Please let me know if you have realized other products or if you have any comments! Martin, Carla D. 2015. Lecture 7: The Rise of Big Chocolate and Race for the Global Market on March 11, 2015. Chuao Chocolatier, chocolate selection. http://chuaochocolatier.com/chocolate-bars.html. Presilla, Maricel E. 2009. The New Taste of Chocolate Revised: A Cultural and Natural History of Cacao with Recipes. Berkeley: Ten Speed Press. Coe, Sophie D., and Michael D. Coe. 2013. True History of Chocolate. 3rd edition. London: Thames and Hudson. Goody, Jack. 1982. Industrial Food: Towards the Development of a World Cuisine. pp. 72-88. Nesto, Bill. 2010. Discovering Terroir in the World of Chocolate. Gastronomica: The Journal of Food and Culture. 10(1):131-135.